The Institute for Human Resources (IHR) holds a business competition in human resources and strategic planning for senior business students. The event gave students the opportunity to meet with business executives. 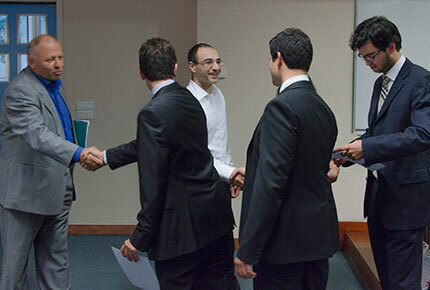 To strengthen the vital link between business education and business practice, the newly introduced Institute for Human Resources (IHR) organized a competition in human resources and strategic planning for LAU senior business students last month. Students vied to impress judges with best overall business strategies centered on real-life case studies of Casper & Gambini’s, an internationally franchised restaurant-café with regional headquarters in Beirut, Lebanon established in 1996. Over the course of the two-days, students carefully considered the chain-restaurants’ business practices such as production costs, training and development, shipping and inventory, pricing and marketing, and social media. “I was very impressed by the high caliber of proposals from each of the teams,” enthused Davina Daoud, head of marketing for Ant Ventures which oversees the marketing of Casper & Gambini’s in Lebanon. “We are always on the lookout for bright new talents and I was impressed by the out-of-the-box thinking that took place during the event,” she added. “The participating students had a very limited time to develop innovative solutions to the problems presented in the case studies,” says senior business student Tala Koujou and executive member on one of the organizing committees. “This experience allowed for a unique opportunity to put our knowledge and skills to the test; a great learning experience for all involved,” continued Koujou. Students were particularly happy to meet with business executives who could share their experience and their insight with them. Tony Boustani, country director of Casper and Gambini’s who took time to meet with the students advised to commit to whatever they undertake. “Commitment is they key for success in life.” Sure enough, participants showed great commitment during the competition. The winning team consisted of Mohamed El Orra, Michel Abdelahad and Abdul Kader Dargham. “We didn’t expect to win; the competition was very tight since all the top students were participating in the event,” said El Orra. This is the first year this competition was held and judging by its resounding success, Zgheib hopes it will be the first in a long tradition. During the awards ceremony, all participating teams were duly recognized for their accomplishments. The first place was $600 dollars, second place was $200 dollars and third place was $150 dollars. Fourth place winners received gift certificates courtesy of Casper and Gambini’s and the restaurant catered the entire event.